1Universidad Autónoma del Estado de México, Facultad de Medicina Veterinaria y Zootecnia, Departamento de Nutrición Animal. Instituto Literario 100. Toluca, Estado de México. México. 50000. 2Universidad Autónoma del Estado de México, Facultad de Ciencias Agrícolas, Campus el Cerrillo. Carretera Toluca-Ixtlahuaca km. 14.5, Unidad San Cayetano, Toluca, Méx. S/ N. 50200. Alternatives to good quality forages for animal feeding include small grain cereals such as triticale (X Triticosecale Wittmack), which presents environmental tolerance and acceptable nutritional value. The objectives of the present study were to evaluate the forage yield, the chemical composition and in vitro gas production of three varieties of triticale (UAEMex, Bicentennial and Siglo XXI), by two conservation method (ensiled or hay). A completely randomized design with three replicates per treatment was used. The Siglo XXI variety got more forage (P < 0.0001) in both fresh and dry matter than the other treatments. There were differences (P < 0.05) between varieties, UAEMex presenting higher content of organic matter (OM 906 g/kg DM) and crude protein (CP, 156 g/kg DM) (P < 0.05), and Bicentennial and Siglo XXI presenting higher content acid detergent lignin (ADL, 72.3 ± 0.3 g/ kg DM). Higher quantities of dry matter (DM), neutral detergent fiber (NDF) and ADL in the hay method (P < 0.05) were observed compared to the silage method. The hay preservation method produced higher values for digestible OM (OMD, 838 g/kg DM), metabolizable energy (ME,MJ/kg DM) and short chain fatty acids (SCFA) in comparison with silage. The variety UAEMex had higher OMD, ME, GY24h and SCFA than the other treatments. Siglo XXI and the silage method showed higher milk yield (kg milk/ ha) (P < 0.005). It was concluded that the triticale variety Siglo XXI was superior to the other varieties by their forage and milk yield potential production, the silage conservation method presented greater fermentation than hay treatment. Las alternativas a los forrajes de buena calidad para la alimentación animal incluyen cereales de grano pequeño como el triticale (X Triticosecale Wittmack), que presenta tolerancia ambiental y valor nutricional aceptable. Los objetivos del presente estudio fueron evaluar el rendimiento de forraje, la composición química y la producción de gas in vitro de tres variedades de triticale (UAEMex, Bicentenario y Siglo XXI), por dos métodos de conservación (ensilado o heno). Se utilizó un diseño completamente aleatorizado con tres repeticiones por tratamiento. La variedad Siglo XXI obtuvo más forraje (P <0.0001) en materia fresca y en materia seca con respecto al resto. Hubo diferencias (P <0.05) entre variedades, UAEMex presentó mayor contenido de materia orgánica (MO 906 g / kg MS) y proteína cruda (PC, 156 g / kg MS) (P <0.05), y Bicentenario y Siglo XXI presentaron mayor contenido de lignina ácido detergente (LAD, 72.3 ±0.3 g / kg MS). Se observaron cantidades superiores de materia seca (MS), fibra detergente neutro (FND) y LAD en el heno (P <0.05) en comparación con el ensilaje. El método de preservación del heno produjo valores superiores para la digestión de la MO (MOD, 838 g / kg de MS), la energía metabolizable (EM Mj/kg MS) y los ácidos grasos de cadena corta (SCFA) en comparación con el ensilado. La variedad UAEMex fue superior para la MOD, EM, GY24h y SCFA con respecto al resto. Las variedases Siglo XXI y el método de ensilaje mostraron mayor producción de leche (kg de leche / ha) (P <0.005). Se concluyó que la variedad de triticale Siglo XXI fue superior a las otras variedades por su producción potencial de forraje y producción de leche, el método de conservación de ensilaje presentó mayor fermentación con respecto al heno. Livestock farming is of great importance to the world’s population as it has to provide food with a high protein value, for which efficient livestock farming is required, with good management practices that include feeding with pasture or quality forage, nevertheless the pasture changes nutritional value during the year, depending on maturity stage and conservation method (FAO, 2017). An alternative for production of good quality forage is small grain cereals such as wheat (Triticum aestivum), barley (Hordeum vulgare), oats (Avena sativa L.) and triticale (X Triticosecale Wittmack), as they represent a viable option in the production of forage and grains in high lands areas, mainly during the winter season where the productivity of other pastures is limited due to low temperatures (Lema, et al., 2004; Ross, et al., 2004). Triticale is a man-made hybrid, developed from wheat grain chosen for disease resistance in combination with rye, selected for its environmental tolerance (Mergoum et al., 2009; Fras, et al., 2016), in addition to being one of the cereals that produces more dry matter, which is useful for animal feed (Estrada-Campusano et al., 2012). There are triticale spring varieties, facultative and winter varieties, and recently an intermediate-winter type has been described based on its production and taste (Zamora et al., 2002). However, except for some reports of forage yield, crude protein, fibers and organic matter, little is known about their nutritional characteristics, triticale is a very good source of protein (11 - 15 %) and essential aminoacids, i.e, lysine (0.33 - 0.71 %) (Fras, et al., 2016). The in vitro gas production technique allows us to determine the patterns of fermentation and degradability of dry matter, depending on the availability of nutrients from the forage, which can later serve to establish feeding programs for ruminants. The objectives of the present study were to evaluate the forage yield, chemical composition, fermentation pattern and in vitro gas production of three varieties of triticale (UAEMex, Bicentennial and Siglo XXI), by two conservation method, since the varieties and the conservation method (ensiled or hay) can affect the availability of nutrients from the forage. The experiment was established in Toluca State of Mexico, between coordinates 19°17’ north latitude and 99°39’ west longitude, at a height of 2675 meters above sea level. The predominant climate is type C (w2) (w) b (ij, which corresponds to a subhumid temperate climate with summer rains, with only minimal thermal oscillation of 5 - 7°C. The average annual rainfall is 1000 mm and average annual temperature is 14 °C. The predominant soil type is Pellic Vertisol of volcanic origin INEGI (2000). Three varieties of spring triticale were evaluated: UAEMex, Bicentenario and Siglo XXI. The sowing was performed on April 24, 2016, with a precision seed drill (model SB-2004-15, sembradoras del Bajio, Mexico), using three replicates for each of the varieties. The experimental unit consisted of seven rows, each one 50 m linear by 30 cm wide, with two sowing lines and a separation of 80cm between them. Each unit had a dimension of 415m2 occupying a rectangular surface of 3735 m2. The planting density was 80,000 plants/ha. The unit was fertilized with 130.43 kg of urea, 195.65 kg of triple superphosphate and 116.67 kg of potassium chloride per ha (60-90-70 - of NPK, respectively) and a post-planting irrigation was applied. After 145 days, sampling was performed by cutting the forage with a brush at a height of approximately 2 cm from the soil surface when the grain was in the milky-mass state, using random sampling for the collection of varieties and taking areas of 5 linear meters of the central rows that form the experimental unit, obtaining three samples of each variety and plot. The weight of the fresh forage was recorded and a sub-sample was taken, placed in an oven at 60 °C for 48h for drying, identified, and the dry matter and moisture content were determined to obtain forage yield (t/ha). After sampling, the entire experimental batch was harvested with a motor cutting machine. From the selected forage samples, one part was harvested and conserved as hay (three samples of each variety, dried in the sun until reaching 85% of DM) and the other part was harvested and was performed six micro-silages (two silages per plot and variety) each one were placed in polyvinyl chloride tubes (PVC) of 20 cm of long x 10cm of width, with a quantity 1.5 kg of fresh forage, compacted well and sealed with polythene bags and adhesive tape to avoid the entrance of air. At 60 days the silage samples were open it, the moisture content of the silages was determined by distillation with toluene (Tejada, 1992). Samples were dried in a forced air oven (60 °C, 48 h), then ground in a mill (Willey, 1 mm 0 Arthur H. Thomas Philadelphia, PA) to determine organic matter (OM) AOAC (1990). Total nitrogen (N) was determined by the Kjeldahl method (AOAC, 1990) multiplied by 6.25 for the crude protein content, and neutral detergent fiber (NDF), acid detergent fiber (ADF) and lignin (ADL) were determined according to Van Soest (1991) with the addition of sodium sulfite without alpha amylase using an ANKOM fiber digester. The Net Energy Lactation (NEL 3x, Mcal/kg DM), kilograms of milk per ton of dry matter produced (kg milk/ton DM) and kilograms of milk per hectare (kg Milk/ha) were calculated with MILK2006 (Shaver et al., 2006). For the in vitro gas production technique, two adult dairy cows (550 ± 25kg) fistulated in rumen were used as donors of ruminal fluid. The animals received a 50:50 diet of oat hay:alfalfa hay and supplement with 1 kg of concentrate (16% CP, 2.8 Mcal DM/kg DM). The food was given ad libitum daily at 08:00 and 16:00 h with free access to drinking water. Gas production was determined by the method proposed by Theodorou, et al. (1994), for which 125 ml amber flasks were used for each forage sample and conservation method. In triplicate and in three sets of incubation, 0.8 g DM of each sample was introduced into the flasks, adding 90 ml of buffer solution previously gassed with CO2 and 700 ml of rumen liquid and 300 g of solid ruminal contents taken from each cow. These were mixed and conserved in a thermo (39 °C). In the laboratory, ruminal fluid was filtered through four layers of cheese cloth gauze and glass wool, the ruminal liquid was maintained at 39 °C and gassed with CO2, then 10 ml of ruminal fluid was added to each flask. Finally, flasks were introduced into a water bath at 39 °C and gas production was recorded using a pressure transducer (DELTA OHM, Manometer, 8804). The volume of gas produced was measured at 3, 6, 9, 12, 24, 36, 48, 64, 72, 84 and 96 hours of incubation. To correct for contamination in ruminal content, two flasks without substrate were used as controls. After the incubation period (96 h), the accumulated gas was released and the fermentation residues from each flask were dried at 60°C for 48 hours to calculate the dry matter disappeared (DMD, mg/g). were: DMD (mg/g DM disappeared at 96 h), DM initial (mg/g DM). To estimate the forage fermentation, the equation proposed by Krishnamoorty, et al. (1991) was used. where, GP is gas production (ml/200 mg DM) at 24 h incubation, CP and ash is in g kg DM. where, GP is the 24 h net gas production (ml/200 mg DM). where, 2.2 mg/ml is a stoichiometric factor that expresses mg of C, H and O required for the production of SCFA gas associated with production of 1ml of gas. where: Yijk = response variable in repetition k, level of J (B), level i of A), g = Average overall, Ai = Effect of factor A at the level of I, Bj = Effect of factor B at the level of J, AB), ij = Effect of interaction AB at ij level and Eijk = Random error. The results of the forage yield (Table 1) of the diffe rent varieties ranged from 7.71 to 14.57 t ha-1 in fresh matter and 2.36 to 5.44 t/ha in dry matter. The Siglo XXI variety was superior (P < 0.0001) in both fresh and dry matter than the other treat ments. In general, the variations obtained among the different varieties of triticale are explained by genetic traits of the crops and environmental fac tors, since all of them were planted and harvested at the same time (Kara, et al., 2009). Similar to our study (Harper, et al., 2017) using different varieties of triticale found forage yields ranged between 2.79 to 2.57 t/ha DM, and Ketterings et al. (2015) reported average forage yields of 4.9 t/ ha DM from 2012 to 2014, which are similar to those found in this study. In contrast, Mut et al. (2006) reported higher yields ranging from 7.78 to 13.55 t/ha DM in triticale varieties, as Dawson (2012) found that the varieties evaluated in his study had 7.5 to 8.7 t/ha DM. These differences depend largely on soil-climate conditions, as well as on the genotypes evaluated in the studies. In addition, these differences may be more significant due to the genotype and environment interaction (Mut, et al., 2006). Table 1 Forage yield (ton ha-1) of triticale varieties (UAEMex, Bicentennial, Siglo XXI). abc Mean values in the same row with different literals are statistically different. The results of the chemical composition and conservation methods of triticale are presented in Table 2. The content of OM, CP and ADL were different (P < 0.05) between triticale varieties. The UAEMex variety presented higher OM and CP, whereas Bicentennial and Siglo XXI presented higher ADL content. Triticale contains around 12-15 % of crude protein, compared with 14% or less for wheat or another cereals (Ammar et al. 2004). The results agree with Rakha et al. (2011) who obtained values from 11.8% to 15.4% CP in different varieties of triticale. Ammar et al. (2004) and Fras, et al. (2016) mentioned that the new varieties of triticale reflect the progress that has been made, increasing their nutritional value since the first varieties were released on the market. Table 2 Chemical composition (g/kg DM) of triticale varieties (UAEMex, Bicentennial, Siglo XIX) conserved as Silage or Hay. abc Mean values in the same row with different literals are statistically different; SEM = standard error of the mean; V x M = variety-method. DM = dry matter, OM = organic matter, CP = crude protein, NDF = neutral deter gent fiber, ADF = detergent acid fiber, ADL = acid detergent lignin. NEL 3x= Net energy lactation 3x (Mcal / kg MS), kg milk/Ton MS= kg milk ton-1 of DM. Calculated milk 2006 (Shaver et al., 2006). A higher content of DM, NDF and ADL was observed in the hay method, while silage presented higher OM content. The lower DM content of the silage is primarily due to its conservation method, which presents more water in its processing, which means that during the silage process the carbohydrates are quickly fermented; moreover, the hydrolysis of the starch and the hemicellulose which occur in this conservation method cause a low concentration of NDF (Muck, 1988). The highest amount of NEL 3x and milk yield kg ton MS was for Bicentennial variety (P <0.05), however the Siglo XXI variety showed more milk yield (kg/ha)(P < 0.05) with respect to the rest of the varieties. The silage method presented higher NEL 3x, milk yield kg ton DM and the amount of milk yield kg/ha (P <0.0001) than the haying method. Very few studies have used the forage yield and nutritional value of the whole plant to obtain milk production per hectare (Mussadiq et al., 2013). The results obtained in this study showed higher values for milk production than those found by Kershen (2010) with triticale's and wheat varieties. The in vitro gas production parameters (Table 3) were observed in fraction (b) (ml gas/g DM), with the UAEMex variety being higher than the other varieties (P < 0.0001). In silage form, a larger b fraction (P < 0.0001) was produced with respect to the hay method. The Bicentennial variety had less lag time compared with UAEMex and Siglo XXI, as well as the hay method had lower lag time than the silage method. 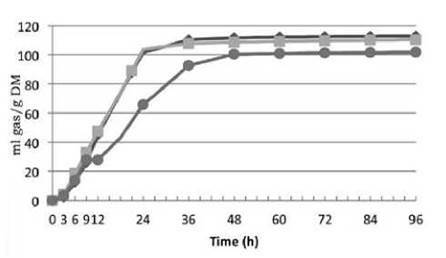 For the fermentation rate (c), the UAEMex variety was higher (P < 0.0001) compared to the other two triticale’s, this in vitro digestibility of OM for UAEMex can be attributed in part to the lower content of ADL (Ballard et al., 2001), likewise in the hay method a higher fermentation rate was produced (P < 0.0001) with respect to the silage conservation method. Digestible dry matter findings are similar with the findings of Kaplan et al. (2014) in different varieties of triticale. When evaluating different varieties of the whole maize plant in vitro, Antolín et al. (2009) reported an average values of 217 and 202 ml gas/g DM for hay and silage respectively, being higher for hay than for silage as presented in this study, higher values than those found in this study, also indicates that the silage of triticale ferment less compared to the corn silage, probably due to their stanch and NDF content. Table 3 In vitro gas production parameters (ml gas/g DM) obtained by adjusting the incubation and digestibility of triticale varieties (UAEMex, Bicentennial, Siglo XXI) preserved by silage and hay. abc Mean values in the same row with different literals are statistically different. SEM = standard error of the mean; V x M = variety-method. b = total gas production (ml gas/g initial DM); c = degradation rate with respect to time (h); t = lag time (h); Pgas = gas production;(ml gas/g DM); DMD96h = Dry matter disappeared at 96h (mg / 100mg); OMD = organic matter disappeared (mg / g DM); ME = metabolizable energy (Mj / kg DM); PF96 = partition factor (ml gas/g DMD 96h); GY24h = gas production at 24 h (ml gas/g DM) ; ScFa = short chain fatty acids(ml/200 mg DM); MCP = microbial protein (mg / g DM). Gas production (ml gas/g DM) (Figure 1 and 2) was lower (P < 0.0001) from 6 h onwards for Siglo XXI variety; from 12h onwards was higher (P < 0.001) for UAEMex than the other varieties. According to Klimiuk et al. (2010) and Herrmann et al. (2011) the higher gas production is related to the lower fiber content (NDF and ADF), which is similar in the present study, the UAEMex variety and in the silage conservation method; this can be attributed in the silage to its conservation process since a slow hydrolysis occurs, leading to a reduction of hemicellulose (Muck, 1988). Figure 1 Production of accumulated gas at 96 h (ml gas/g DM) of triticale varieties (UAEMex t; Bicentennial ; Siglo XXI l). Figure 2 Production of accumulated gas at 96 h (ml gas/g DM) of triticale varieties preserved by and silage (l) and hay (t). The OMD, ME and SCFA (P < 0.0001) were greater in the hay method compared with the silage method. Studies have shown that the lower ADL and higher CP in the triticale improved fiber digestibility (Harper, et al., 2017), which was reflected in the increased OMD, DMD, PF96, and SCFA in the variety of UAEMex, leading to better fermentation than Siglo XXI and Bicentennial varieties. The variety UAEMex showed a greater fermentation rate than the other triticales (Bicentenario and Siglo XXI), and the silage method is an appropriate conservation method since the fermentation produced during this process present higher NEL (Mcal/kg DM). Siglo XXI present higher forage yield and as a consequence higher milk yield production (milk kg/ha). This project was supported by 4335/ 2017 UAEMex; Lizbeth E. Robles was granted a CONACyT fellowship.